MOST Premier League teams like to cross the ball into the box. It is an exciting and threatening move, and puts the opposition’s goal in danger. But how effective is it really? Can a team make extensive use of crossing to develop an effective attack? Between November 2010 and April 2012, Liverpool under Damian Comolli attempted to build an attacking team based on crossing. The key players in the strategy were Andy Carrol, who signed in January 2011, and Stewart Downing, Jordan Henderson and Enrique who all signed later that year. The timeline of events is shown below. Carrol was regarded as an outstanding aerial player. In 2010, 37 of Carrol’s attempts on goal were assisted headers, and 22 attempts were from cross assists, the highest number in the division. Downing, Enrique and Henderson were prolific crossers of the ball; in 2010 Downing ranked 2nd highest in total crosses behind Leighton Baines, while Henderson ranked 9th in crosses from the right and Enrique 6th in crosses from the left. I define Liverpool’s Crossing Era as starting in July 2011 when the key players were in place. The era ended on 12th April 2012 when Comolli left the club. What happened in the 2011 season was unexpected – and disappointing. Between them, the whole team produced 787 crosses from open play. Despite this being more than any other team in the division it produced a meagre haul of only 4 assisted goals. This might imply that a game built on crossing cannot possibly work. But is that so? It is certainly true that very few crosses result in direct assists. In the EPL as a whole, between 2010 and 2014, only 1.2% of crosses resulted in goals. But perhaps direct assists is not the best measure of crossing effectiveness. A better measure might be the number of crosses that result in a goal shortly afterwards. If we look instead at crosses followed by a goal within five seconds, the average conversion rate is substantially higher at 1.8%. (We call this the X5 conversion rate.) In the period in question, Manchester United had an X5 conversion rate of 2.9%, with 28% of their goals coming from crossing. Had Liverpool matched that performance, their crossing tactics would have produced 23 goals in 2011. The pattern is quite clear. During the Crossing Era, when the key players were all in place, Liverpool were averaging 21 crosses per match, but by the time Downing left the club, the rate had dropped to about 12. It’s painfully obvious what went wrong with Liverpool’s strategy here; the X5 conversion rate during the crossing era fell below 1%. It begs the question why. One possible culprit is the quality of the crossing. How many crosses actually reached a team-mate? The data show that Liverpool’s cross completion during the Crossing Era was just over 19%, close to the EPL average. 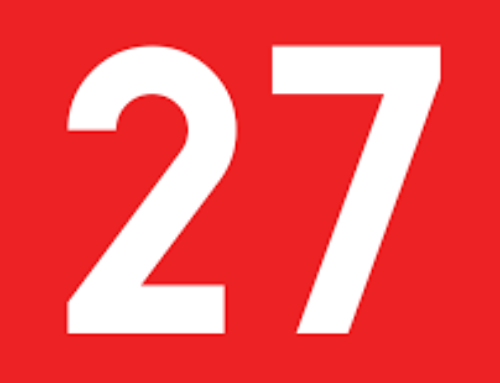 Outside the crossing era, the completion rate was only 15%. So clearly, crosses were reaching the forwards, but they weren’t being turned into goals. Obviously, this could be because Liverpool’s forwards were just not very good at taking chances. But perhaps there might be something about the quality of Liverpool’s crossing. To shed some light on this aspect we need to look at crossing in general. 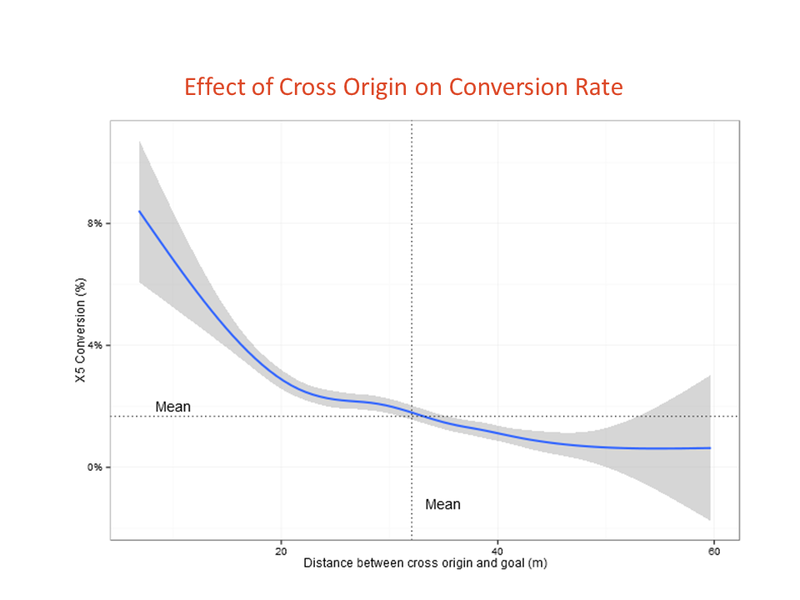 It turns out that the crossing distance (how far away from the goal the cross originated) affects the X5 conversion rate. 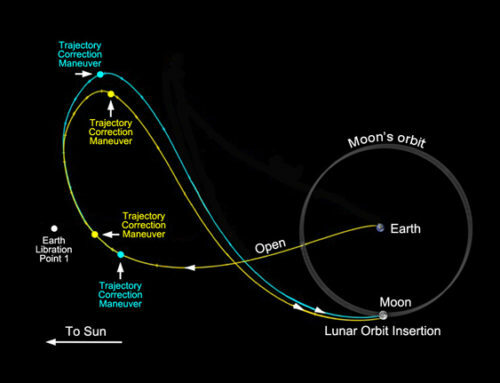 The crossing distance is measured as in the diagram below. 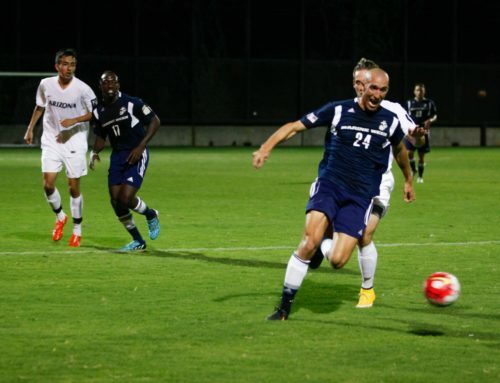 A ball crossed from closer to the goal has a bigger chance of producing a goal than a cross taken from further out. The figure below shows the relationship between the crossing distance and the probability of scoring within the next five seconds for the four EPL seasons 2010-2013; it is quite clear that crossing from closer in has a substantial effect on the X5 conversion rate. Another interesting fact about crossing is that teams who cross more frequently tend to cross from further out. To control for possession effects we measure a team’s propensity to cross as the number of crosses from open play, divided by the number of open play touches in the final third. If we look at the 80 Premiership campaigns in the period, we find a strong correlation (.73) between the crossing rate and crossing distance. The chart below shows the relationship. 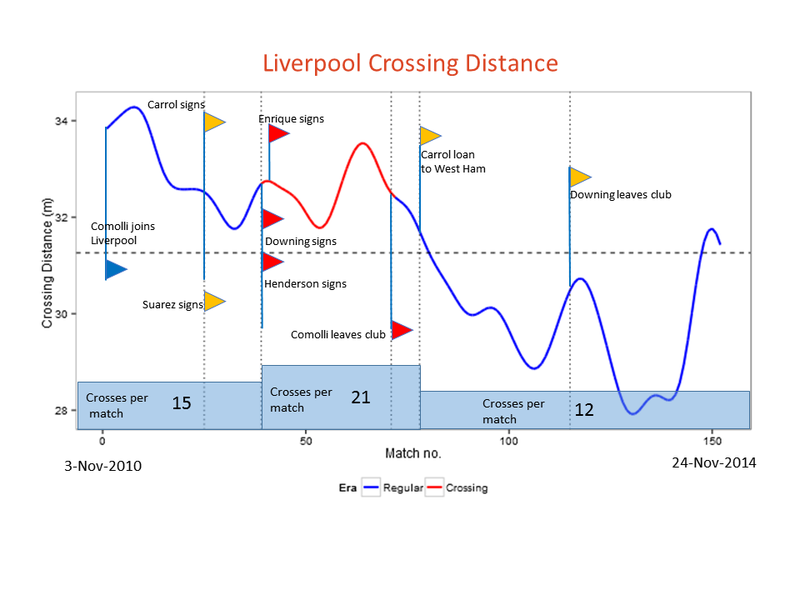 So how did Liverpool’s crossing distance change over time? 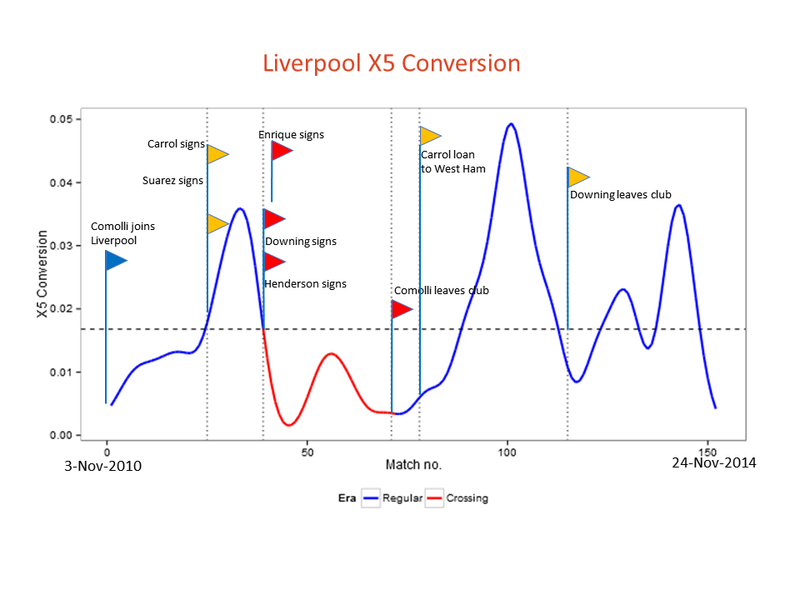 The chart below shows Liverpool’s crossing distance in three different periods; before the Crossing Era (after Comilli joined the club), the Crossing Era itself, and after the Crossing Era. It also shows the average number of the crosses per match in the corresponding time periods. We can see from the red and blue line that before the Crossing Era and during the Crossing Era, Liverpool crossed from further out. In this period, when Comolli was at the club, the crossing distance averaged 32.8 m. However, after Comolli left the club, the team rapidly started to cross from closer in, and in this period the crossing distance averaged 29.6 m.
We can now see the problem. Before and during the Crossing Era, Liverpool were crossing from too far out. Because there were substantially fewer crosses (15 per match) before the Crossing Era, crossing from distance was not quite so problematic; but in the Crossing Era proper, when Liverpool were relying very heavily on crosses (21 per match), this high crossing distance became an issue. 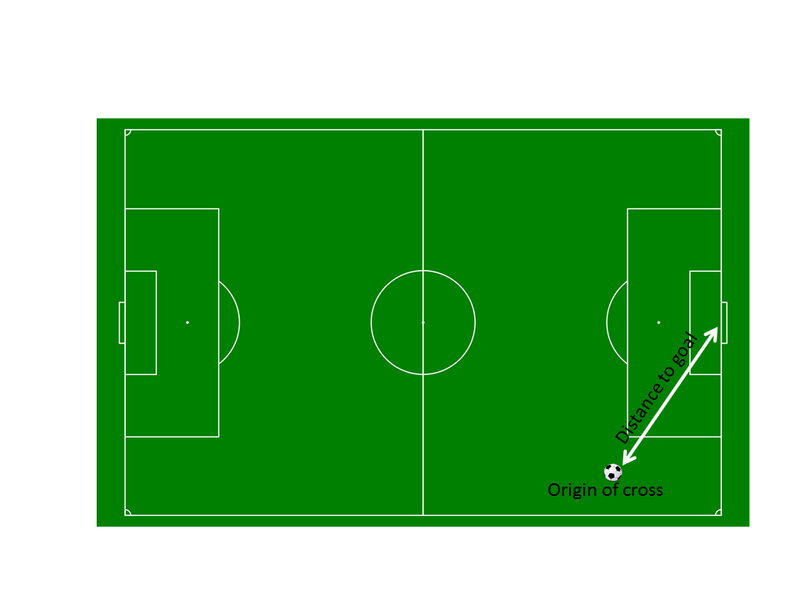 Crosses can be effective, but only if they are delivered from the right areas of the field. Generally speaking it is better to cross from closer in. There is no point in building an attacking strategy around high volume crossing if the crosses are made too early. Of course, there are quite a few characteristics of crosses that I haven’t looked at here, for example whether the cross is made from the byline or deep (though that is partly defined by the crossing distance) and whether it is to the far post, pulled back etc. I hope to look at this at some future time. 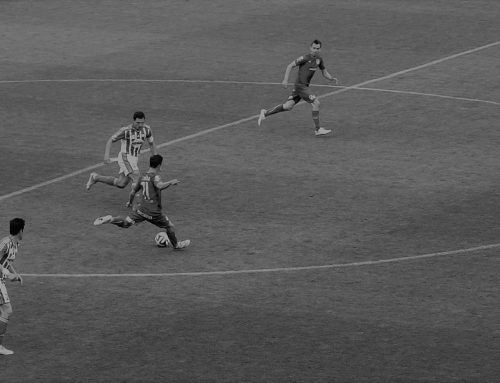 Nevertheless, it is important for teams to monitor the characteristics of their crossing game, in particular where crosses are delivered from, and focus on delivering crosses that count. Is there a correlation between the fall in the number in crosses post Comolli and the league average during that period. Although I have no data to support this, but I’m sure the managers were beginning to adopt a patient build-up and possession based system (Southampton, Swansea, Blackpool, to name a few) were some of the few clubs during that era that came up from the lower division and adopted a different strategy and not the normal hopeful cross into the big man in the box. Also, you didn’t say anything about the managers during and after that crossing era.The philosophies of the managers might not have been suitable for the players during that era. But regardless, It was a really interesting article, I understand the point of the article was to highlight the relationship between number of crosses and crossing distance and also the quality. Good read. Can’t wait for the follow up. Thanks for your interest and your comments. I don’t think the league average changed much during the period though. I found your article very interesting but not surprising. I recently completed my PhD on goal scoring patterns and at different levels of professional football, including EPL , ‘A ‘ League, World Cups and European Championships. The lowest category was Crosses in all competitions. I had a a specific area for Crosses, rather than different distances, which was outside the penalty area and within 20 yards of the goal line. My research looked at other areas of the field where passes behind opponents could be assigned to, so it was important to differentiate between that category and Crosses. The figures I attained for most EPL clubs were between 10% and 15% of all goals in Open Play. Man Utd in 2011-12 were the highest with 20% of their total and that was an outlier. I still find it difficult to come to terms with commentators who refer to passes from inside the penalty area or from the middle of the pitch as ‘Crosses’. At times it would seem that any pass in the air maybe described as a Cross regardless of its origin. The position of the back four is certainly a key factor, but Opta (whose data I used) don’t record it. They also don’t have a specific definition for crosses, the classification is manual; an Opta cross will include passes from the edge of the penalty area, and just inside it, and diagonal balls into the area from some way out. If you publish (or have published) anything from your thesis, I’d be interested to read it.